You can imagine, then, the disappointment when on checking the tickets it became apparent that there had been a mistake. “You got the wrong day?” she asked, her face lighting up with the possibility of an entirely theatre free weekend. And then she did. And as it turns out, she had good reason to. Men Should Weep runs (in the preview performance I saw*) for every minute of its advertised running time and is constantly, unflinchingly, unremittingly depressing for each and every one of its 165 minutes. 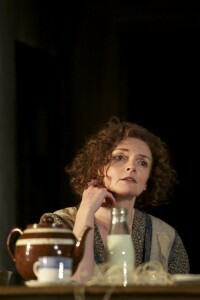 Set in a 1930s Glasgow slum, matriarch Maggie (Sharon Small, very good) presides over her rag tag of a family: ambitious Jenny (Sarah MacRae, overdoing it a tad), passionately in love Alec and Isa (Pierce Reid and Morven Christie, solid) and various other “weans”. There is a plot (well plots, really) too exhausting to describe and, while there is the occasional heart-warming or feel-good moment, these are swiftly brought to an end by some offspring or other clumping up the stairs to deliver news of some fresh proletarian catastrophe. After a sink hole swallows Alec’s house (really) and Bertie gets TB (no spoiler – it’s obvious from the moment the kid starts coughing) then every time the door opens you expect some herald of doom to announce an accident at the mill, Hitler invading Poland, the shrinking of the polar ice caps, the collapse of Lehman Brothers or 33 Chileans stuck in a mine. There’s really no unfortunate event too miserable to be visited on this family by the playwright. The design (Bunny Christie) is superbly National – three full floors of tenement house rendered in loving detail and filled with actors, many of whose only contribution to the work is the top of their heads, their feet and their Equity credit. Scene changes are signalled by blinding white neon outlines being drawn around each flat, which I quite liked. My companion didn’t like much about the production (especially the last two hours which unexpectedly cut into restaurant time and forced us to move our Skylon reservation to 10:15 rather than the optimistic 8:15 we had hoped for originally) but she really hated the white neon, which “stuck out like a sore thumb”. Beyond convincing us that it was probably really tough growing up in a slum in the 1930s in Glasgow – we believe you Ena – it’s difficult to take too much away from Men Should Weep. While it’s difficult to imagine a more thoroughly designed, directed and performed production of the play than Josie Rourke’s here, the constant monotone of misery and dreariness on display here added little to my understanding and there were relatively few moments to enjoy. Update 27 October: I was remiss not to note originally that this was a review of a preview performance. Things can change; and it sounds like quite a lot has changed with this show before press night. I think the play you meant to book for at the National is Or You Could Kiss Me in the Cottesloe. It is not quite 45 minutes but 1 hour and half with no interval, but it does have puppets representing 2 of the main characters. I personally would say though that you made the better (if not intended) choice! Thanks. I think I might take myself a wee break from the National, so doubt I’ll make Or You Could Kiss Me. Besides, the Cottesloe is practically the fringe.